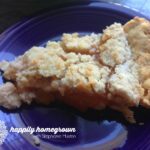 Fresh baked peach crumb pie using home-canned pie filling. Prepare your crumb topping by cutting the butter into the cinnamon, sugar, and flour mixture until it looks like coarse sand. Role out your pie crust to fit a 8-9 inch pie plate. Open your jar of pie filling, and pour it into your crust. Bake at 450° for 15 minutes, the lower the temperature to 350°, and continue to bake for another 45 minutes. Remove your pie from the oven and allow to cool before serving.